Please contact Krissy Jenkins on 0400686443 to arrange a private inspection for this great property! This double level home has everything that you have been looking for and more. It is a lifestyle opportunity for those that are looking for relaxing times with family on the deck overlooking the pool surrounded by trees. The good news is that this property offers this lifestyle without a ridiculous price tag attached. Bring some love along and this would be a magnificent buy! The spacious home has been designed with entertaining in mind. Upstairs you will find a comfortable lounge & diningroom which overlooks a huge deck perfect for those who enjoy the outdoors. This living area also includes a reverse cycled airconditioner. I know you will love the polished timber floors that are found throughout upstairs. The kitchen has plenty of room and is not isolated from the rest of the house. Of course, there are plenty of cupboards including a pantry. There are 3 lovely bedrooms. 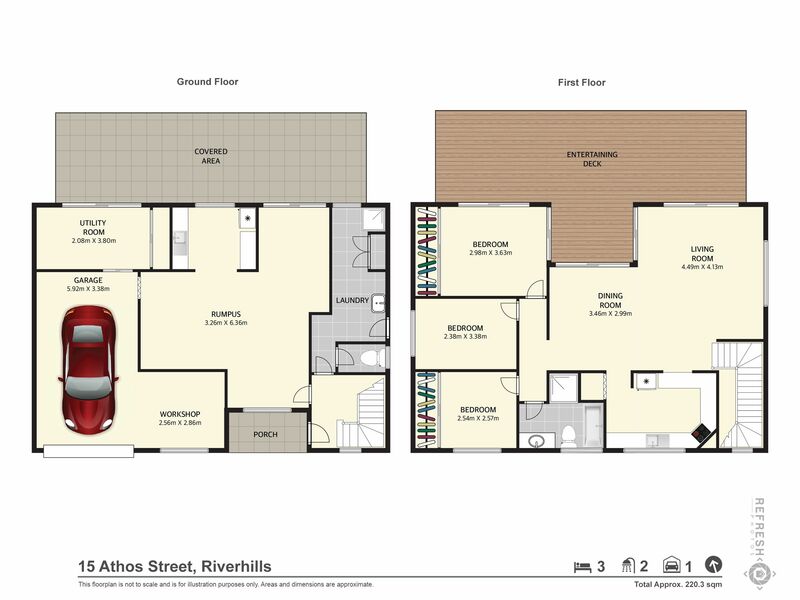 Two of the three bedrooms are builtin and I love that the main bedroom not only has a reverse cycle airconditioner but it also opens out onto the deck. The bonus of this home is the fact that there is a whole separate living area downstairs. As you can see from the floor plan there are so many uses for what it has to offer. There is what could be used as a central lounge, a kitchenette, a study area, a utility room that has builtins and also a 2nd bathroom. This is great for the teenagers or for when the family comes to stay. There is a single lock up garage and also a workshop area. I have saved the best for last! Get your summer on with this gorgeous inground pool with bonus wading pool. Invite all your family around on Christmas Day and relax in and around the pool. All of this on a 549m2 fenced block in the leafy suburb of Riverhills. Riverhills is a well established suburb in the Centenary Suburbs. This home is a less than 5 minute drive to Mt Ommaney Shopping Centre and Jindalee DFO. Middle Park State School is within walking distance as well as plenty of public transport options.